Who’s Your Daddy!! The all new 2007 Jeep JK Wrangler has just barely hit the streets and Full-Traction Suspension is already releasing the very first in a sure to be, extensive line up of high quality suspension lift kits, components and armor for it. In fact, to the best of my knowledge, Full-Traction Suspension is the ONLY company putting anything out for the JK to date. So what exactly is it that they’re releasing you might be asking? Well, for one, how does a complete 3″ suspension lift kit that’ll get you running 35″ tires and all for about $500 sound to you? Yup, you heard right, that’s 35″ tires and without needing any major modifications to your drive train. 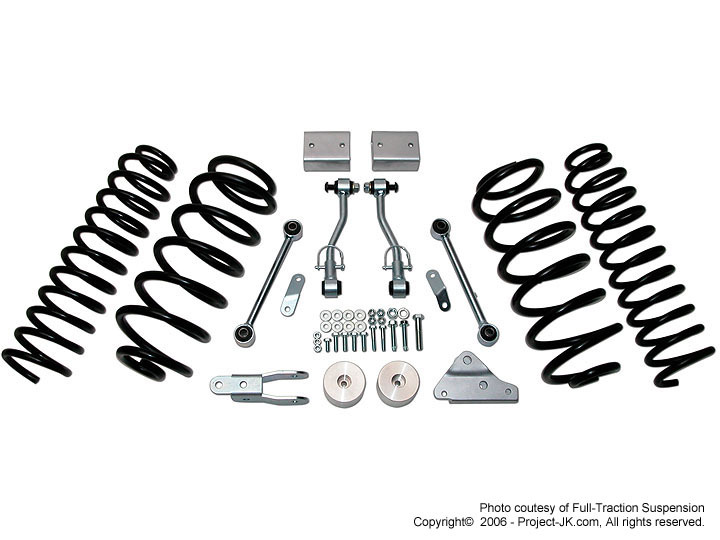 With this kit, you will get front and rear springs, front track bar bracket, rear track bar bracket, front & rear sway bar links, billet aluminum bump stop extensions, brake line extension brackets, and complete detailed instructions. Add an additional $170 and you get a set of Full-Traction 5100 Shocks or add $280 and get a set of awesome Full-Traction M-Force Series Shocks to complete your kit. Or, if you’re on a budget, how does $280 sound for a 2″ Economy Kit that includes shocks and everything you need to get you running 33″ tires? 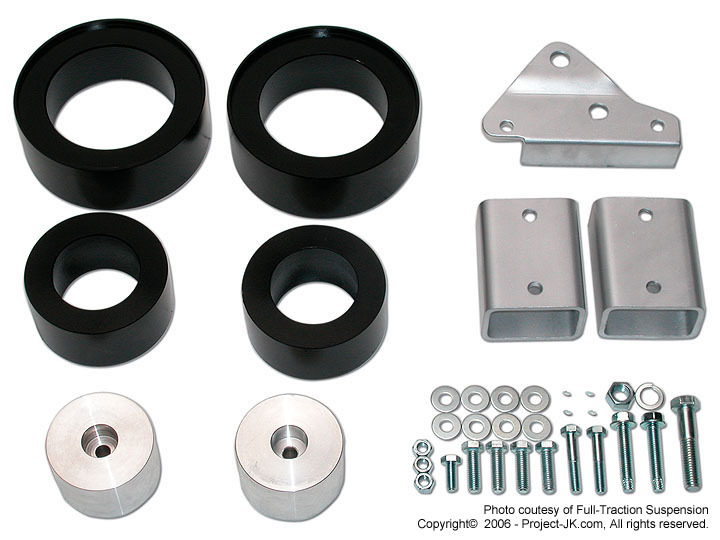 This kit comes complete with front and rear spacers, front track bar bracket, billet aluminum bump stop extensions, Full-Traction 5100 Hydraulic Shocks and complete detailed instructions. To top it all off, Full-Traction Suspension will also be offering an Ultra Heavy Duty front and rear adjustable track bar for sale for only $180!! And to think, all this time, I thought waiting and saving up enough cash to get a new Jeep JK was bad enough. Now, I find myself suffering through the early stages of the “I wants” for stuff that’ll go on a vehicle I don’t even own yet. Thanks Full-Traction Suspension, that’s just what I needed. FYI: To the best of my knowledge, Full-Traction Suspension Jeep JK suspension lift kits and components are now available and can be purchased today at Northridge4x4 and Quadratec. I had someone ask me whether the springs in this kit were TJ coils or ones that are made specifically for the JK Wrangler as Skyjacker states. And, for the record, I can tell you that these are in fact spring made specifically for the JK Wrangler and that at least in the rear, TJ coils wouldn’t even fit. So there you have it. Eddie, since I’m used to running 37’s with my Unlimited when do you think you’ll have a 6″ Long Arm kit available. I’ll be holding out for that and are the upper mounts on the JK thicker than the factory TJ tin foil mounts? Eddie, i’m looking to just run 33×12.5’s but want a full suspension kit not the spacers. have you seen what 33’s look like on a 3in lift kit, or do 33’s just look to small on a 3in lift. (graystone 4 door 07 jk X) any links to pics of 33’s on a 3in kit?? thanks…! awsome spot of your rig in the mag! I know a 4″ long arm kit is in the works now but don’t know if there’s gonna be a need for a 6″. Sorry but I don’t have any pics of that but can tell you that based on what I have seen, I think 33’s will look a bit small on a 3″ lift.